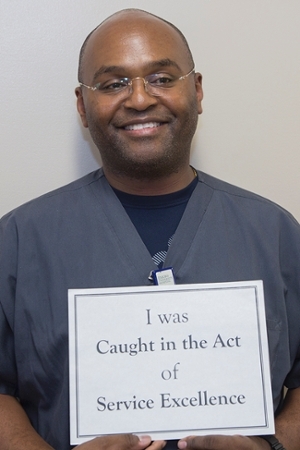 The “Caught in the Act” program is designed to recognize notable acts of service excellence for which an individual or a team goes out of their way to exceed the expectations of a patient or staff member. In August and September 2015, two employees were recognized for going above and beyond in support of service excellence. Each year, as we prepare for the annual faculty and staff awards ceremony, one somewhat daunting task is to gather photos of all award nominees, including several teams. This year there were at least 50 photos - six of them were of teams - and very few photos were already "on file." What's more, the nominees are spread out across several sites. Kevin Makowski showed a great deal of initiative contacting all nominees for their picture and making sure the job got done. Kevin contacted nominees at St. Joseph's and Johns Creek, and then drove out to them, a wonderful demonstration of anticipating the needs of others. He also kept in touch with other project team members with frequent status updates. Kevin's very efficient and service-oriented style, along with his excellent communication skills, helped make this rather daunting task a quick "thing of the past." He's also very fun to work with, and several of the nominees mentioned how flexible and great he was to work with for the photos. Thank you, Kevin, for your commitment to service excellence, active engagement, outstanding communication, efficiency and courtesy to others. Last month Victor Njoka was scanning patients in the emergency department at EUH during a very busy time. Toward the end of his shift he came across a patient needing a CT scan of the cervical spine w/o contrast. During the CT scan of the patient's neck, Victor saw what appeared to be a spinal fracture and immediately informed the ER radiology department so they can get on top of the exam with a proper reading. Victor also had the tech aide bring a stretcher back to the CT suite and insisted the patient lie on the stretcher and do as little moving as possible until he received a diagnosis, even though the patient's RN insisted he was OK and didn't need to be placed in a stretcher. Though the patient came in complaining of neck pains, Victor not only performed a great scan, but may have saved this patient from long term paralysis. 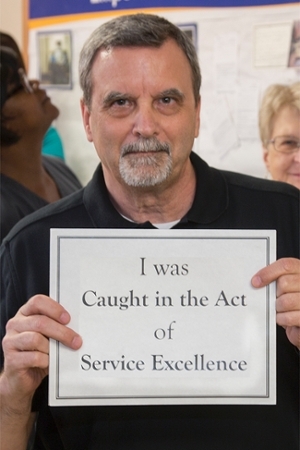 Remember, if you catch anyone in the act of service excellence; please tell us the story by following this link to our short and simple online submission form.